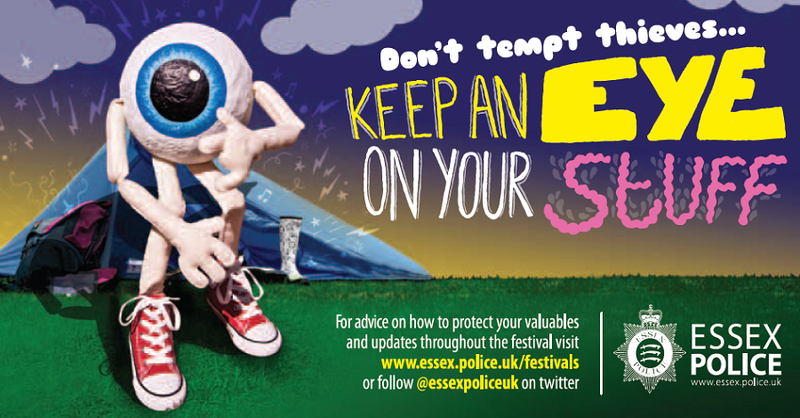 Essex Police are ensuring that those attending Virgin Group’s annual V Festival remain vigilant, with an outdoor campaign from Transport Media that reminds music fans that thieves are in operation. A mobile Advan will target Chelmsford on Friday the 16th August for 2 days, blanketing visitors arriving at the campsite for the festival, which takes place on the 17th and 18th. 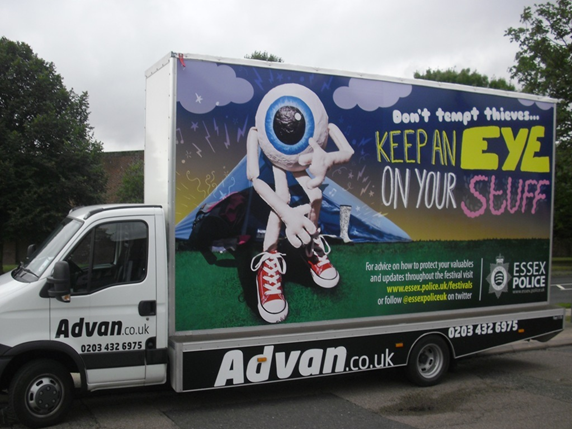 The Advan artwork features a cartoon eyeball figure placed on an animated campsite backdrop, reinforcing the campaign statement ‘keep an eye on your stuff’. Presented in colourful, lively lettering, the title benefits from long-range visibility and is endorsed by the Essex Police logo. An accompanying paragraph guides onlookers towards the Essex Police website, with a Twitter handle allowing social media interaction. Founded in 1996, V Festival was originally titled to represent each year – such as V98 – until 2003, when it adopted the current universal moniker. Hosted annually during the penultimate weekend of August, the festival is held simultaneously at two venues in the north and south of England, with artists performing once at each location. This year’s line-up includes major names in the music industry, such as Beyonce, Kings of Leon, Stereophonics and Calvin Harris. Guided by Transport Media, Essex Police are able to adopt the most effective marketing method for their objective, settling on the swift coverage gained through the use of an Advan. Fortified with the ability to geographically target audiences and capable of accessing relevant areas quickly, the Advan will expose the Essex Police advert across arriving festivalgoers during its 2 day presence. Supporting the southern half of V Festival at Chelmsford’s Hylands Park, the campaign will provide highly refined communication without advertising wastage.